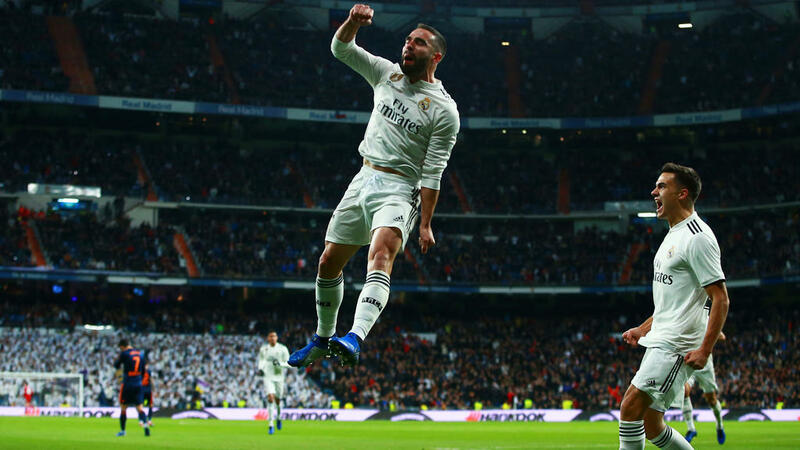 Real Madrid's revival under Santiago Solari appears to be back on track after they moved up to fifth in La Liga with a 2-0 win over Valencia on Saturday. An own-goal from Valencia's Daniel Wass gave Madrid an early lead before Lucas Vazquez added a late second to wrap up their sixth win in seven games under their new coach. Otherwise, Madrid controlled the contest and while Gareth Bale's league drought stretched to 10 games, his longest ever, the Welshman played a lead role in an energetic and fluid team performance. Bale seemed more pinned to the left wing than he has been for a long time and he rolled back the years with a straight run down the line before whipping in an early cross. Karim Benzema's ambitious volley sailed just wide. Madrid had made much the better start and in the eighth minute, took the lead. Wass headed into his own net but Dani Carvajal led the celebrations. He kept the ball alive before rummaging past Gabriel Paulista and Jose Gaya. The flicked cross gave Wass too little time to react. Valencia made hardly any impact on the half, pressed and harried into submission. Neto skewed a clearance under pressure to Dani Ceballos, whose shot was blocked, but then made up for his error by denying Bale from close range. Fortunate only to be one behind, Valencia improved after the break. Santi Mina blazed over with only Thibaut Courtois to beat. Gaya's cutback was slightly misplaced. Paulista volleyed over on the stretch from three yards. Bale was replaced by Marco Asensio and, once on the bench, seemed to signal some discomfort with his right thigh. After some slick exchanges down the right, Asensio should have given Madrid breathing space but his finish was blocked by Ezequiel Garay. Isco came off the bench in the 80th minute and played a part in the second goal. Carvajal was again the instigator, however, setting off on a barnstorming break forward before exchanging with Isco and crossing. Benzema did well to pick out Vazquez, who poked home to complete a convincing win.